In recent decades, the world of work has undergone a number of major transformations, which in turn have had considerable impact on both work organization and employment relationships. These changes have often been introduced for economic reasons in the context of increasingly globalized markets. However, it is becoming more and more apparent that they sometimes have negative impacts on workers’ health and safety. This survey was carried out as part of Québec’s Minister of Labour’s responsibility for conducting a study of changes in working conditions in Québec every five years, in collaboration with the organizations concerned, with the ultimate aim of influencing the future course of public policy (see section 11 of the Act respecting the ministère du Travail, R.S.Q., c. M-32.2). 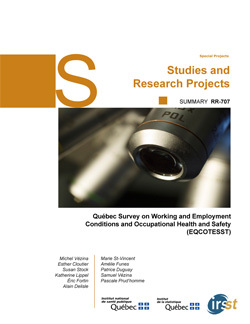 A better knowledge of working and employment conditions and how they relate to the health and safety of Québec workers is vital to providing strategic support for orienting occupational health and safety (OHS) research and interventions in Québec. Thus, in 2007, the Institut de recherche Robert-Sauvé en santé et sécurité du travail (IRSST, (Québec’s occupational health and safety research institute), the Institut national de santé publique du Québec (INSPQ, Québec’s public health institute), the Institut de la statistique du Québec (ISQ, Québec’s statistics institute), the ministère du Travail (Québec’s ministry of labour), the ministère de la Santé et des Services sociaux (Québec’s ministry of health and social services) and the Commission des normes du travail (CNT, Québec’s labour standards commission) joined forces to undertake the Québec Survey on Working and Employment Conditions and Occupational Health and Safety (EQCOTESST), which was carried out by the ISQ. This survey focuses specifically on work-related musculoskeletal disorders (MSDs), traumatic work accidents, and mental health in the workplace, as well as on workers’ perceptions of their general health. Consistent with efforts being made in many other countries, it seeks to better understand the links between work organization and health and safety in order to orient research and preventive interventions with regard to working conditions and OHS in Québec. A lexicon defining the terms used in the full research report (full report available in French only) and in this summary report is appended to this document. This summary report follows the order of the chapters in the full report. It presents the main results of the survey, suggests avenues for action and future research, and provides a general conclusion.